Underlying all the statements set out on this site is a conviction that those who live at Mellor Nook do so with dignity and respect from those who support them, they live with no reduction of their rights as citizens and are entitled to live as full and active a life as their physical and mental condition will allow. Whatever their age, whether sound in mind and body or experiencing disability, residents have a fundamental right to self-determination and individuality. Equally, they are given the right to live in a manner and in circumstances which correspond as far as possible with what is normal for those who remain in their own homes. Mellor Nook strives to enable residents to achieve their full capacity physical, intellectual, spiritual, emotional and social even when they have a progressive disease such as dementia. We aim to achieve this by sensitive recognition and nurturing of that potential in each individual and by an understanding that it may change over time. Residents and their well-being are the central focus at Mellor Nook. It is the interests of residents, individually and collectively, that assumes priority over the home, its management and staff. This means that residents are accorded a standard of care and attention which respects individuals' privacy and dignity, recognises their diversity and individuality, fosters their independence, offers them choice and enables them to control their own lives wherever possible. Some basic principles underlie the rights which are accorded to all who find themselves in the care of Mellor Nook. The importance of preserving the privacy and dignity of residents is paramount. This means that people have their own individual private space and the opportunity to choose how they dress, what they eat, when they go to bed and get up and how they spend their day. Dependence on staff for help with personal care doesn't mean that their dignity is compromised or that their privacy is not respected. Residents are treated as adults, never as children. Staff always avoid adopting patronising attitudes and behaviour towards residents. Residents determine how they want to be addressed by staff, other residents and visitors to the home. The preservation of self-esteem amongst the residents who depend on our support hinges upon the status they are accorded. Staff and management do not make the mistake of seeing residents only as frail old people who simply need help. We value the contribution which individuals with their personal qualities, talents and rich experience of life make to the life at Mellor Nook. Residents' self-esteem is enhanced if they feel valued and in this way their morale is maintained. Staff treat residents courteously and respect their privacy and their right to hold and express opinions or to keep them private. We assume that residents can look after themselves and handle their own affairs until it has been shown otherwise. They may need time to do things themselves but our staff and relatives resist the temptation to 'take over' unless absolutely necessary; otherwise they make residents unnecessarily dependent. Wherever possible, residents are able to make for themselves the major decisions affecting their lives. They are also able to choose how they spend their time from day to day. For example, this means that individuals are free to decide how far they participate in the common life of the home and how far they maintain relationships with family, friends and the local community. This exercising of choice is a right which often requires a partnership between resident, relatives and ourselves in which choices can be negotiated. Some residents particularly those who are very frail and vulnerable may need help to express their wishes and preferences. All residents have access to external advice, representation and advocacy.. Residents also have opportunities for emotional and sexual expression and for intimate and personal relationships within and outside the home. 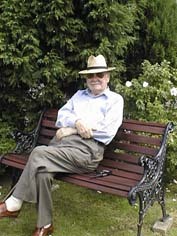 Even though residents are living at Mellor Nook with other people, they remain individuals with their own likes and dislikes. Staff are responsive to the requirements of individual residents. Ethnic, cultural, social and religious diversity is recognised as an integral part of home life. Residents feel that their needs are responded to willingly by staff who understand the value of maintaining a sense of continuity and identity based on past traditions and practices. For their part, living in a community with others requires that residents recognise and respond to the rhythms and needs of other people. It is helpful for residents to have some knowledge of the life experiences of staff to act as a bridge between them. This emphasises personal connections outside the home and their relevance to those within. Opportunities are made available for religious and political beliefs to be expressed and pursued. This involves observing particular dietary and dress requirements and facilitating practices such as prayer and contemplation which requires privacy and quiet or enabling residents to attend places of worship. Residents are kept safe and feel safe. Wherever possible, fears and anxieties are acknowledged and relieved while recognising at the same time that over-protectiveness and undue concern for safety may lead to infringements of personal rights. Responsible risk-taking is regarded as normal and important in maintaining autonomy and independence. Residents are not discouraged from undertaking certain activities solely on the grounds that there is an element of risk. The balance between risk and safety is carefully maintained. Anxieties raised by staff and relatives are discussed, where possible, with the individual resident concerned and agreement reached which balances the risks against the individual's rights. Each resident has a formal agreement (provided by Mellor Nook or Social Services) setting out the care to be received in the home, the conditions of residence and the fees payable. 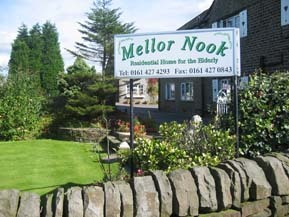 Mellor Nook values the role which relatives and friends continue to play in the lives of residents. Their participation is encouraged wherever residents wish it and their contribution recognised as an important part of the residents' care. Provision for leisure activities both in and, outside the home we feel is essential. This is sensitive to individual tastes. Resources existing in the neighbourhood are engaged to help meet the needs of residents. The quality of life at Mellor Nook is enhanced by inclusion of the widest possible range of normal activities, particularly those with which residents have been familiar in the past. This includes opportunities to go on outings, to go shopping, and attend places of worship if it is within the individual's capacity to do so. However Mellor Nook is a quiet home and no one is preasured into doing anything they don't want to. Individuals receive the level of care which their own situation requires. Our care meets high standards and satisfies the full range of physical, clinical, personal, social, spiritual and emotional needs of the individual. Care and treatment is provided only if it will be positively beneficial. Care does not mean unnecessary restraint. Treatment (the administration of certain drugs, for example) are never given for the convenience of the home. Residents have ready access to the appropriate care given by an appropriate person from within or outside the home. It is always provided with respect for the individual's privacy and dignity and with mutual agreement between the resident, the doctor the family and the home . Wherever possible, and whatever the resident's declining state of health or financial position, continuity of care is always assured. Residents do not have to move out of the home to receive additional care (unless dictated by their medical needs). If possible, this is brought into the home by external services. If we cannot provide all necessary care, transitions between the home and the person's own home, or the home and a hospice or hospital is made as smooth as possible. Residents (and their relatives or advocates) are able to complain about the care they receive if not happy, without fear of being victimised or being asked to leave. However if it is the choice of the resident or family to leave, we will provide all the help and support required.